Just announced: Project Oxford (http://www.projectoxford.ai), a project that aims at providing powerful APIs for developers that are looking to use face, speech and language recognition capabilities to their applications. The site of Project Oxford provides a way to interact with the APIs currently available. 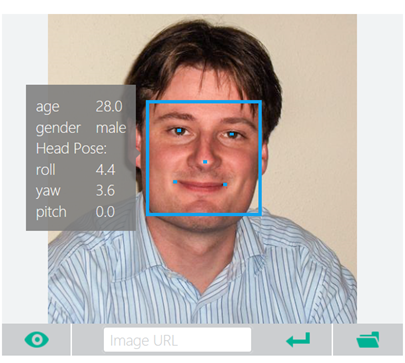 In this first look we will focus on the Face APIs that can be used for face detection (finding faces in photos, determining gender and age), age verification (checking that a person in two photos is the same), similar face searching, face grouping and face identification. This is actually quite good, this picture was made a while ago and I was 29 at the time, so not too far off. This is very powerful stuff, I am looking forward to start using this in projects. Will keep you posted on that.